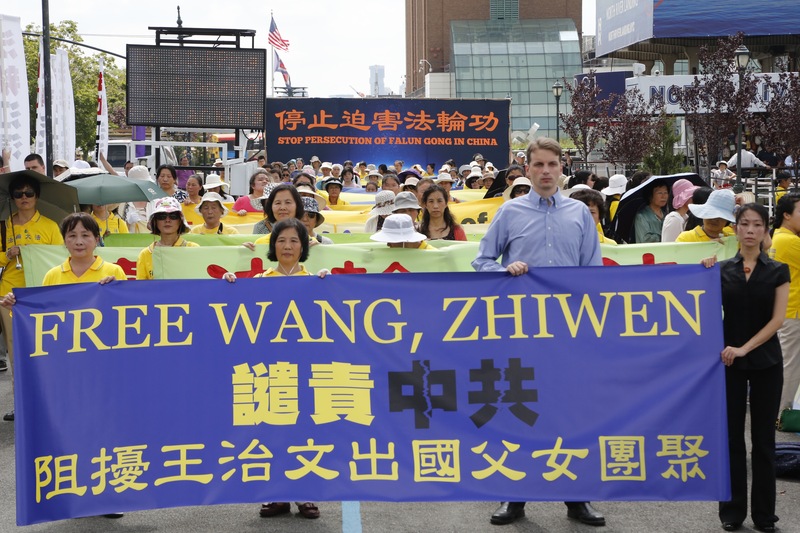 NEW YORK—Two hundred people joined a demonstration across the street from the Chinese Consulate in Manhattan on Aug. 11, demanding that the Chinese authorities allow Wang Zhiwen, a prominent prisoner of conscience who is now under a form of house arrest, to be re-united with his daughter in the United States. Wang was one of the first volunteer coordinators of the Falun Gong spiritual practice to be thrown behind bars on the night of July 20, 1999, when the Communist Party launched its still-ongoing campaign of persecution against the group. Months later he was put through a show trial and sentenced to 16 years imprisonment. He has been out of jail for two years now, but still cannot travel. “We still don’t know where he is,” said Danielle Wang, his daughter, in a speech given at the demonstration, two days after she and her husband arrived empty-handed in Newark International Airport. “We’ve been kept sleepless at night, fearing for his safety,” Danielle said. Danielle’s father was constantly shadowed by police during their visit. 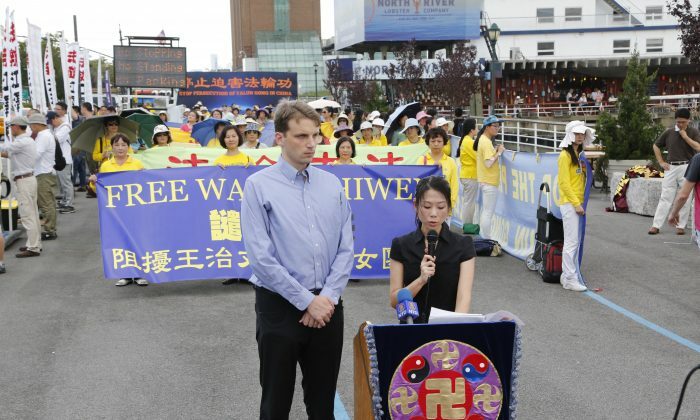 He believes the sentinels were dispatched from the 610 Office, the Party agency set up in 1999 to carry out the persecution of Falun Gong. Shackled with a hefty sentence, Wang was tortured, forced into slave labor, and separated from his daughter for years. Released two years ago in an emaciated and toothless state, he was watched over by plainclothes police and undercover agents. Deciding to join his family in the United States, Wang obtained a passport and, with the help of his daughter Danielle Wang and her husband Jeff Nenarella, attempted to escape via the southern Chinese port city of Guangzhou. The flight to freedom was terminated, however, when the elder Wang’s passport was inexplicably cancelled and then clipped by customs officials at the Hong Kong border, forcing the briefly-reunited father and daughter to painfully part ways. According to Danielle’s husband, prior to his father-in-law’s flight to Guangzhou, a policeman had come to Wang’s home and threatened him for daring to consider emigration. Falun Gong is a spiritual discipline based on the principles of truthfulness, compassion, and tolerance, and includes five meditation exercises. In the 1990s, it became a popular and well-received part of society, with government bodies praising its benefits. That came to an end in 1999, when it was arbitrarily banned on orders of then-Communist Party head Jiang Zemin. 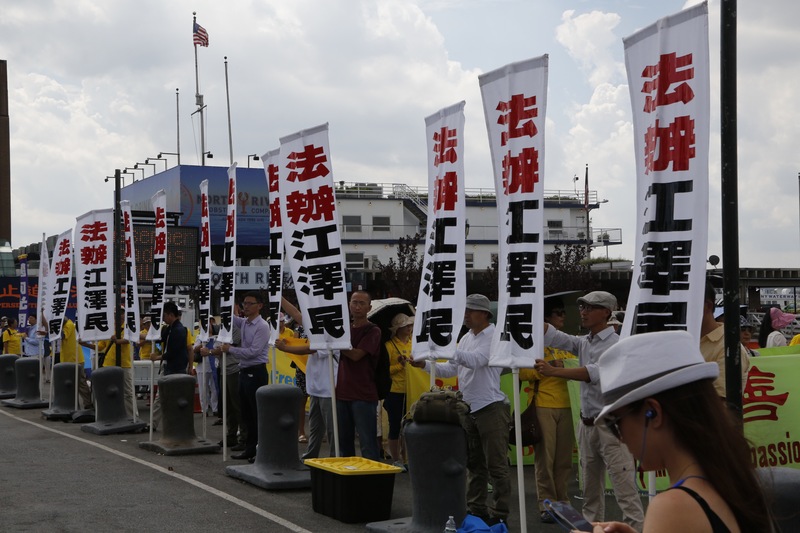 Among those in the demonstration, many were Falun Gong practitioners who had also been subject to imprisonment and torture at the hands of the Chinese regime. Chen Dongming, a practitioner from the southeast province of Zhejiang who was denied graduation from college and surveilled by the police for his faith in Falun Gong, said that Wang Zhiwen’s case was both inspiring and telling.